Completely manufactered in stainless steel, they are suitable to the worst and different working conditions in every industrial field. They are particulary recommended for the operator safety, because in case of loss or a breaking of the sensing element, the internal pressure makes the exploding bottom of the gauge detach while the solid front remains intact. 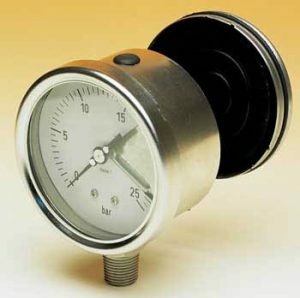 Same gauge of MXSF series but filled with liquid to reduce the stresses caused by the vibrations of the installation, pulsating pressures or water hammers. MOVEMENT: AISI 304 stainless steel. Range: from 0/0.6 to 0/1600 bar or vacuum.